Ancient cultures knew what was good for them. The Incas made a ceremony of planting the first quinoa of the season with a golden spade. 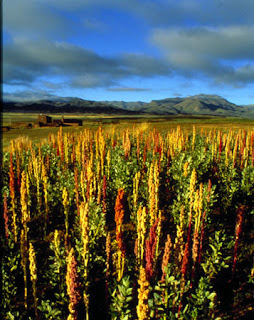 Cultivated in South America for more than 7000 years, quinoa was called "chesiya mama," mother grain in Quechua. Because the plant had non-Christian religious significance, cultivation was suppressed during the European conquest, and quinoa was not widely used again in the Andes until the 1900's. In North America, quinoa is now gaining popularity, but primarily in health food stores and gourmet groceries. A "supergrain", the quinoa plant is a complete protein source because it contains a balance of the amino acids required for human health. It is also one of the trendy "gluten free" foods. Quinoa is a relative of spinach and Swiss chard, so a grain in name only. What we use is actually the seed. Why isn't this slightly nutty tasting crunchy protein on every table? Unprocessed quinoa needs to be soaked or rinsed to remove the outer layer of bitter saponins. This is hardly a huge hurdle for a cook, but requires some forethought for busy mothers. A one lb. bag of quinoa is around $5.49 or approximately 1.75 times more than one lb. bag of brown rice which is around $3.25 and this is the unwashed variety. Processed quinoa costs a little more. Aside from the extra preparation steps and additional expense, there is also the issue of what to do with quinoa. As a stand alone substitute for rice, it may not be attractive from an appearance standpoint. To me quinoa looks like the calamari of grains, and I don't like calamari. But as with rice, there are countless ways to prepare this grain. My best experience with quinoa in Peru was always as an ingredient in soup. For a great soup recipe and a taste of Peru, read Culinary Musings, a beautifully photographed blog about a trek to Machu Picchu where quinoa soup literally gave them the energy to scale great heights. Try making quinoa soup closer to home.